The Capital Collections online library offers a large range of images from the collection of Edinburgh City Libraries and Museums. Edinburgh City Council use iBase software to curate the images and make them available via a custom-built public website, where users can order prints or digital copies of them. 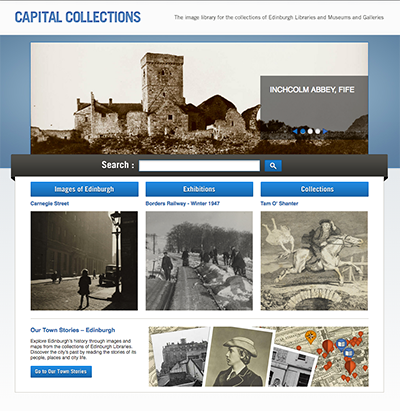 Capital Collections is the digital image library for Edinburgh Libraries and Museums and Galleries. It provides online access to many of the collections held in the Central Library and highlights from the Museums’ collections. Edinburgh City Libraries staff use iBase's management interface to upload and curate content, manage relationships between artists and works of art, create exhibitions for special events and publish the results to the public web site. The public website was built in cooperation with libraries staff and a third-party design company - once the functionality and layout was agreed, the designers provided iBase with sliced Photoshop files that were used to incorporate the design elements into the standard template. At the same time, iBase developers worked on the custom functionality that had been agreed on and added it to the standard features of the core product. Exhibitions embracing records about the same or similar topics. Geolocation data is displayed on an interactive map of Edinburgh and relevant results are automatically grouped. Timeline with images grouped by decade so visitors can explore the history of Edinburgh by period. Links to images and data of interest can be emailed to friends or colleagues. A wide ranging and detailed subject hierarchy leads new visitors into the rich and varied content. Buy prints or digital files with the option to download immediately. In addition to providing members of the public with a valuable local resource, the Capital Collections website has proved to be a strong source of revenue for the council. iBase's digital asset management software met our custom requirements perfectly.